I love simple old recipes that I make so often that their edges are worn down and they taste sure of themselves! There are several such recipes handed down in my family that I make without looking at the frayed recipe card. Don’t you just love the grandma handwritten recipes on index cards or in spiral notebooks stained from frequent miles?!?! Biscuits are my favorite. There’s nothing like a warm fresh out of the oven pillow of buttery yumminess slathered in homemade jam or dripping with my husband’s honey. Yes, he is a bee keeper, but that’s another story. My mom would make biscuits every Saturday morning and I have carried on that tradition as often as possible with my children. 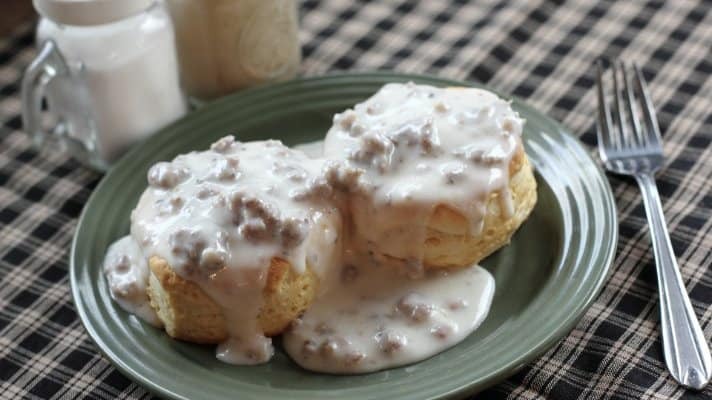 When my boys were teenagers, they would smother their plateful of opened biscuits with sausage cream gravy for their first go-around then follow with another plateful drenched in syrup or honey. And now I’ve taught my grandchildren the same simple old recipe. Even our nine year old can make biscuits with minimal help. A good simple recipe is a formula that can be relied on to produce consistent results. I can’t help but relate this picture of consistency to real-life scenarios. How rewarding is it when we include tried and true ingredients like good friends, good conversation, good food, and a welcoming environment to shake and bake a repast? With such a recipe, I can participate confidently in the nourishment I’m receiving and leave gratefully energized by the incredible people in my life. What simple old recipe works for you? Cut shortening into dry ingredients till crumbly, stir in buttermilk, turn on to a floured surface, pat flat, fold over, repeat the process several times, cut with biscuit cutter, bake at 375 till golden.